But not for a while. 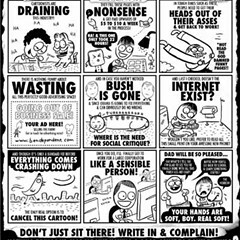 Groening's hip Life in Hell was a fixture in the Reader's hip classified section from the early 80s until classifieds all but vanished from newspapers about a decade ago. Then the comics that had made those endless pages of agate so much fun to thumb through began to vanish too. I told the story in a 2009 column called "Comics Stripped / As alt-weeklies drop their funnies, is the end of a genre near?" 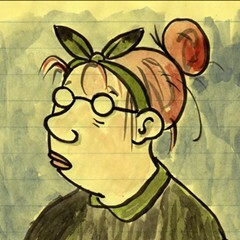 At that point, Groening's buddy Lynda Barry had already stopped drawing Ernie Pook's Comeek. 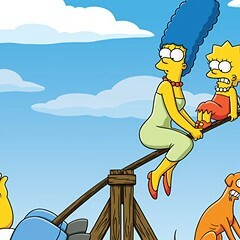 Life in Hell survived as a labor of love—Groening had made his stash with The Simpsons—but he was beginning to wonder. Barry told me, "I know Matt's conflicted about this and what he's going to do. Like every one else, he's in fewer and fewer papers. But he really does not want to give up his strip, he doesn't want to quit. But quitting is lovely. I love to taunt him about how magical it is to not have a weekly deadline after 30 years." And Groening said, "It's very difficult, when you're sitting there trying to come up with a punch line and you call up Lynda Barry and say, 'Do you have any ideas?' and she says, 'Yes. Quit.'" Now he has. 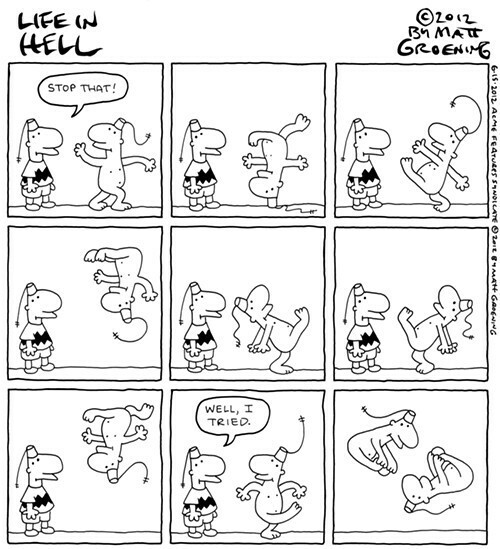 He stopped drawing Life in Hell in mid-June. We haven't carried Life in Hell since we changed our format last year. But this is his last cartoon! Damn the cost (80 bucks). Here it is. And for old time's sake, here's Groening riffing on language, his "forbidden words of the 90s." A long time ago—the 90s. Then this language made his skin crawl, and probably ours too. Now—it's not only dead, it's inert. As alt-weeklies drop their funnies, is the end of a genre near?